How to run a file automatically after cd is inserted using Autorun.inf ? You are here: Home / Tutorial / How to run a file automatically after cd is inserted using Autorun.inf ? 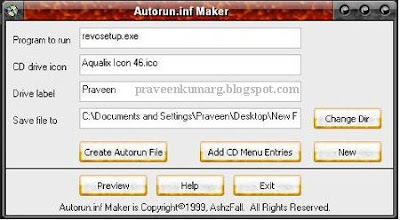 Many of us want a Application to run Automatically when Cd is inserted.This can be made easily by creating a Autorun.inf File in the directory of your Cd.For this there two methods.The First method is creating Autorun.inf using Utilities.The second method is creating a Autorun.inf File using Notepad. 2.Using this Utility you can assign Icon,Drive name & Most important run a .exe Appz when you insert a Cd. 7.Now you need to Check whether this Works or Not.So dont waste any Cd for Testing. 8.Burn these Files using Nero to Imagedrive. 10.When you Double Click the drive i will Lauch the Application which you have set in Autorun.inf File.Here i have given revounistaller Setup,so this appz is lauched automatically. 4.Now Burn the files in Cd. 5.When you Insert the Cd the Application Will Launch Automatically. I hope this Tutorail will be useful for you.If use some other Utilities Share it here.